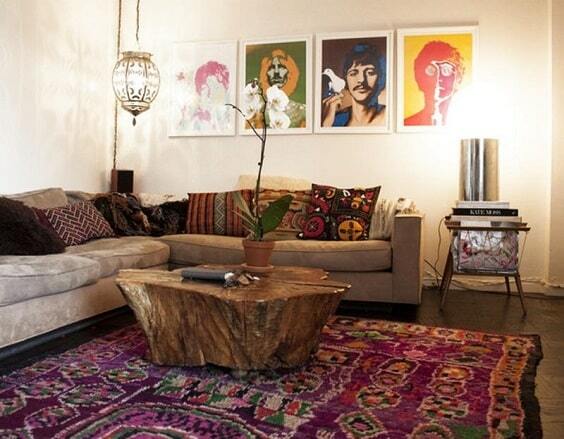 When you are looking for one of the most stylish living room decorating styles, Boho is always the top answer. It’s such an attractive decoration that will never fail to make a room look as stylish as possible. 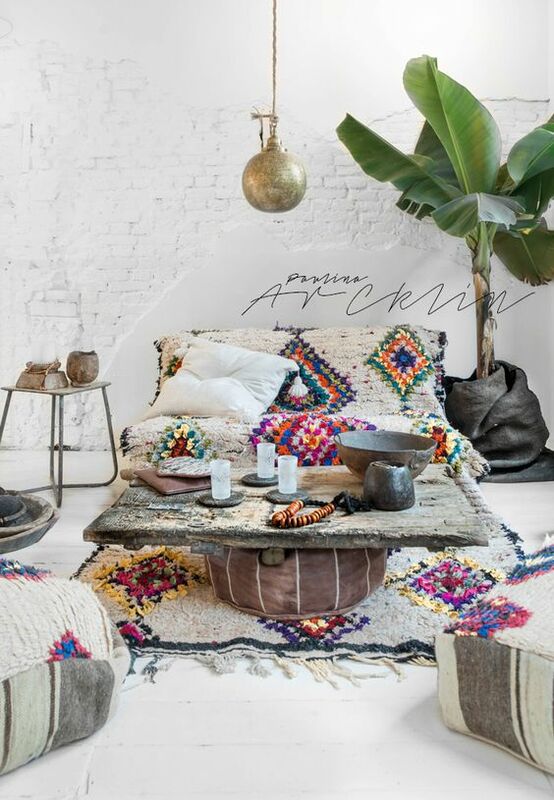 Characterized by lots of various textures, patterns, colors, and materials in one decoration, the Boho theme surely fits for you who love a room full of chic items. The wooden sofa on a festive rug, furry linens scattered around the room, fresh indoor plants, or vintage light fixtures are some stuff that can create a fabulous Boho decor. For sure, Boho decor is so applicable to a living room since you can explore it with numerous elements of the room itself. Furthermore, the theme can work really well in creating a very comforting atmosphere for everyone. Here, we have collected dozens of mesmerizing Boho living room ideas which are designed by the incredible home designers. 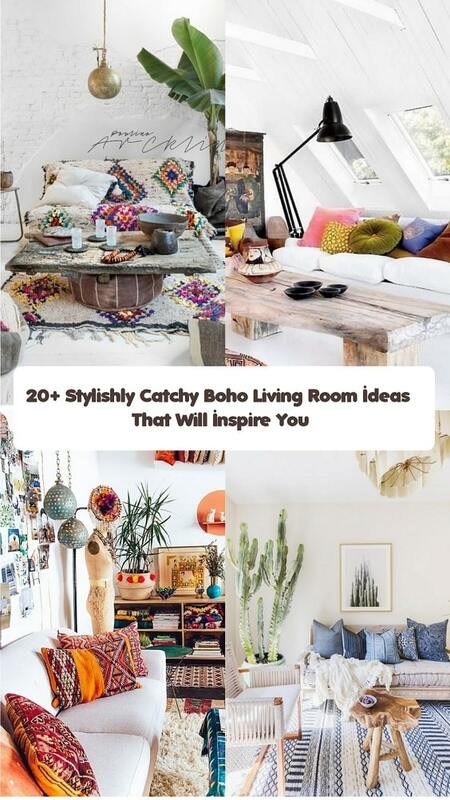 They will totally inspire you to bring the Boho vibe to your very own living room. 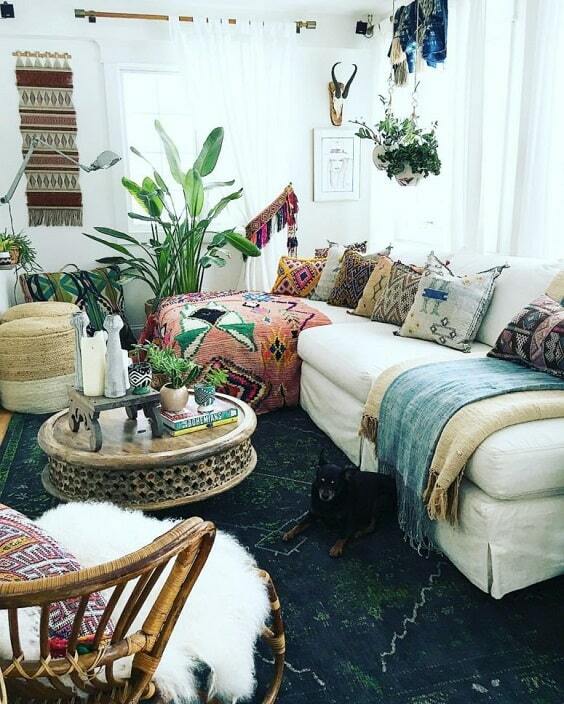 So, let’s just keep scrolling to check out our best picks of Boho living room ideas! 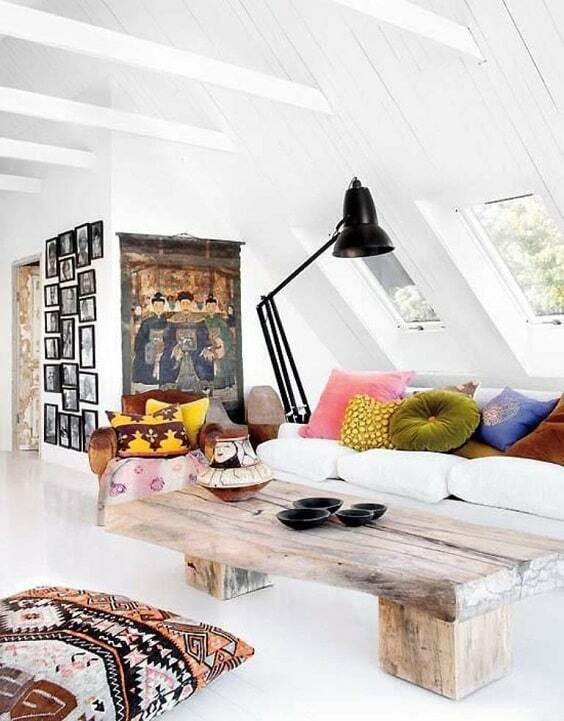 This one is basically an all-white living room which is decorated in Boho style beautifully. The decorative pillows, log-style table, and tons of wall arts are enough to style up this Boho living room from Nordic Design. A good inspiration for you who have a limited space in your living room which is designed by Gino Brother via Architectural Digest Russia. Though the room is not wide enough, it’s filled with lots of stuff while still keeps the comfort of the room perfectly. 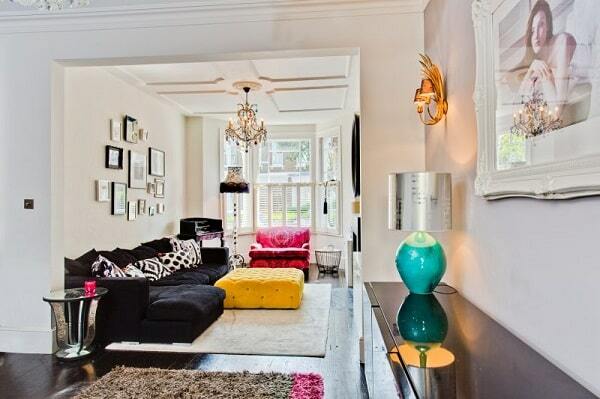 The sofa really matches well with the rugs and those wall arts complement the chandelier gorgeously. Thanks to the room’s white dominant color which neutralizes its overwhelming decor. 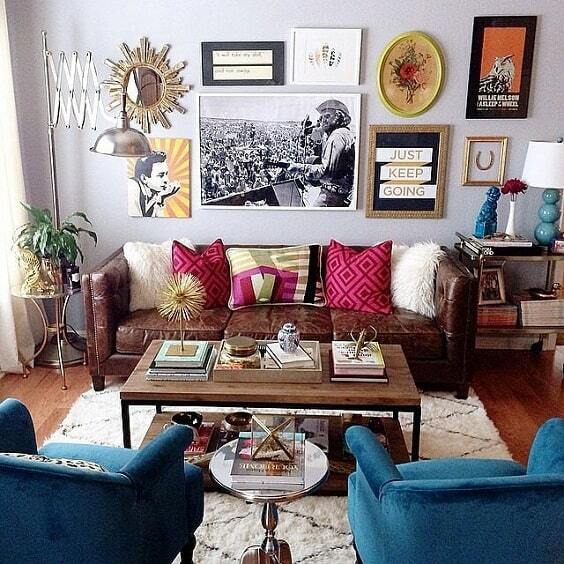 Two armchairs in teal give a chic bold statement to this festive Boho living room in a very simple yet attractive way. Their colors popped up perfectly among the neutral and deep color scheme of the room. Again, the wall is decorated with lots of decor items which flow well with its vintage leathery brown sofa and its catchy throw pillows. The combination of white and brown in this beautiful Boho living room by Lauren Liess via Mix and Chic is absolutely inspiring to steal. 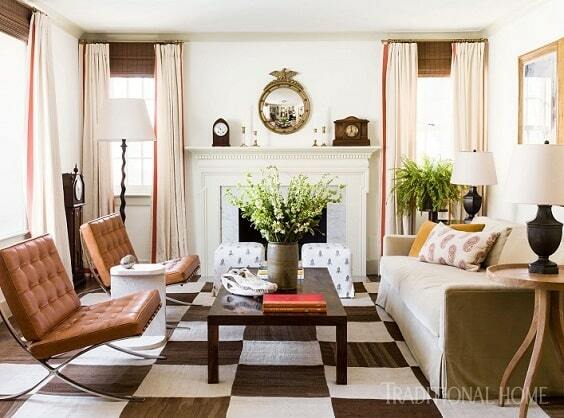 A chequered area rug balances the nuance of the room and also gives a catchy decorative touch at the same time. 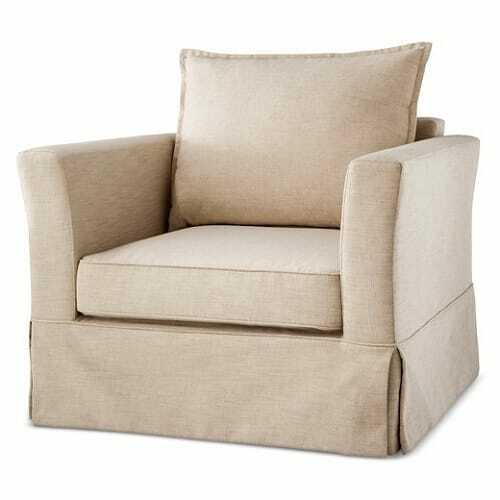 The soft beige drapes give a more textured look which enhances the attractiveness of the room. 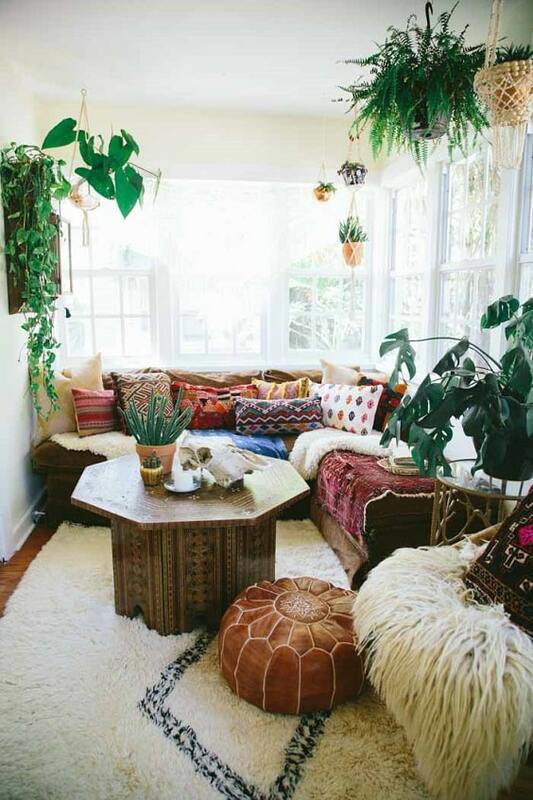 Paige Morse, an interior designer and art director created this unique Boho living room which resembles the indoor garden with tons of the indoor plant inside. The room is surrounded by earthy glass window which allows the outdoor surrounding to complement the room. The vibrantly decorative red rug than brings the style of the room to a whole new level. To create a warmer vibe with a dazzling look, soft beige is used to colorize the walls in this admirable Boho living room designed by Amanda Barnes Interior Design. The organic furniture beautifully decorates the room and the blue decorative rug adds another color alongside those blue throw pillows. In addition, a huge cactus gives a more natural nuance which complements the furniture uniquely. 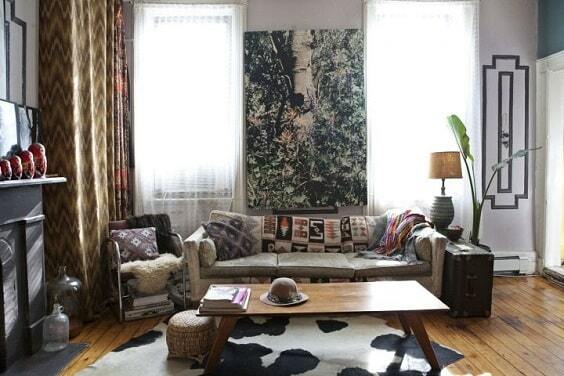 This idea has lots of patterns and textures which makes it so worth to add to your Boho living room inspiration list. However, the colors of most elements are in soft tones which makes the room doesn’t feel too overwhelming and more soothing to the eyes. Then, lots of indoor plants also complete the decor to add more organic materials inside. 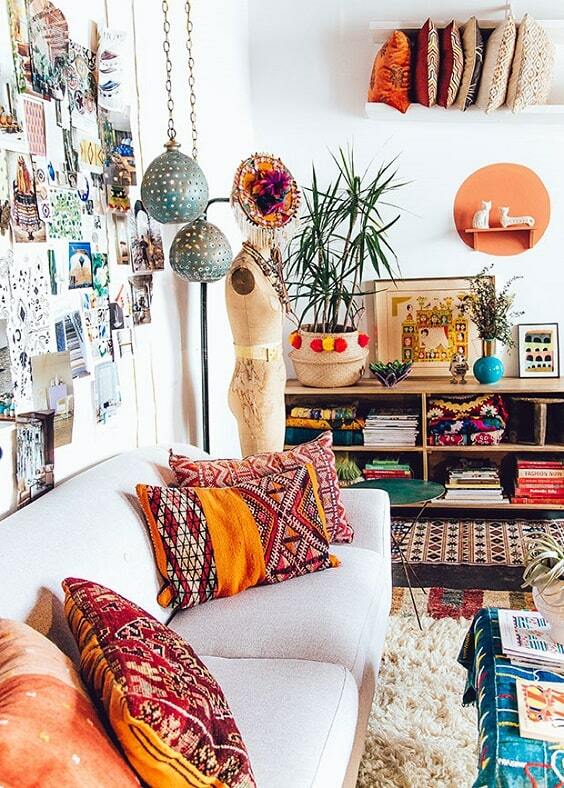 Justina Blakeney, an art director of Jungalow Studio created this festive living room with lots of unique items in one decor. You can see woods, metal, plants, tons of patterns, textures, and artworks blend cleverly to be a very attractive decoration. 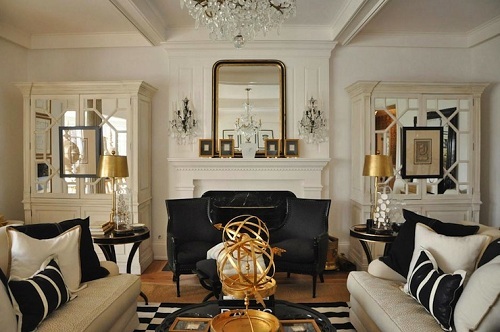 Again, white is used to become the color that neutralizes the decor and brighten up the whole room. Spotted on The Shelby Studio, this Boho living room doesn’t use any furniture inside but it uses lots of pillows and an area rug which works as the sitting area. The combination of patterns of the linens makes the room look so catchy for sure. It’s such a good inspiration to create a comfortable relaxing spot that you can try effortlessly. 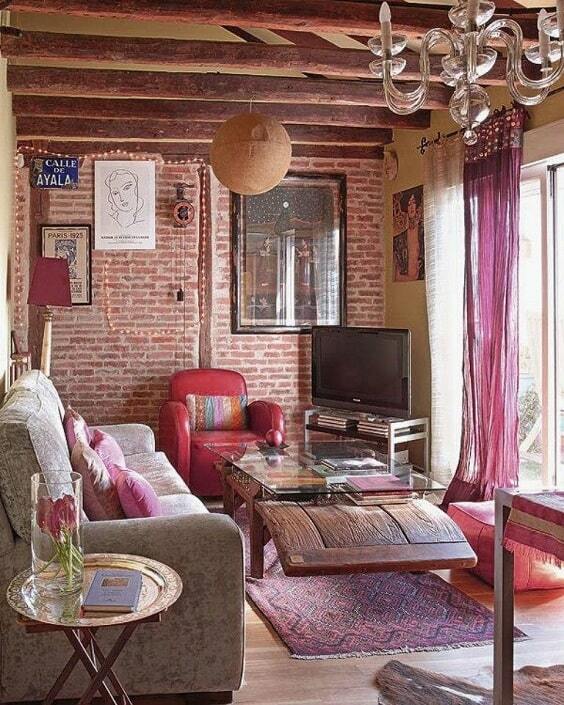 The bare brick wall and wood beams distinctively style up the room and make it look as rustic as possible. Then, the choices of furniture in various style and design even makes this Boho living room become more and more attractive. To help the room stay bright and cozy, a huge glass window perfectly lets the natural light to come through. 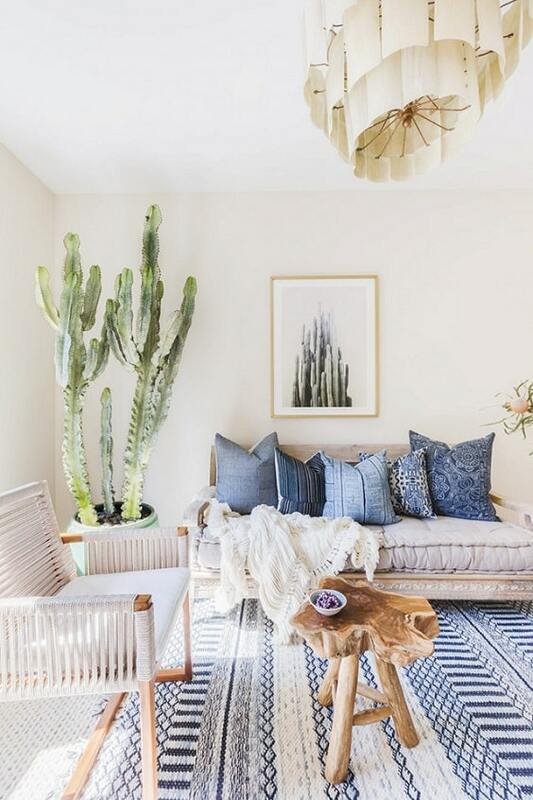 Designer Schuyler Samperton via House Beautiful shares her beautiful Boho living room with an inviting refreshing atmosphere that everyone surely loves. The sitting area which includes a white sofa, ethnic pillows, floral wall arts, and indoor plant absolutely an attention grabber which happens to be the main focal point of the room. 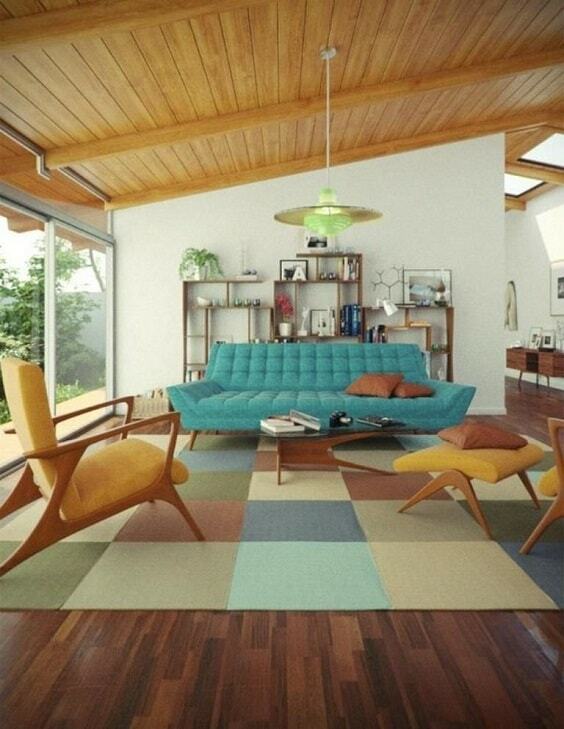 Moreover, the white walls and ceiling with a decorative rug in brown also enhances the earthy nuance. Sometimes, you just need to choose some accessories in bold prints to give a surprising factor for a living room. 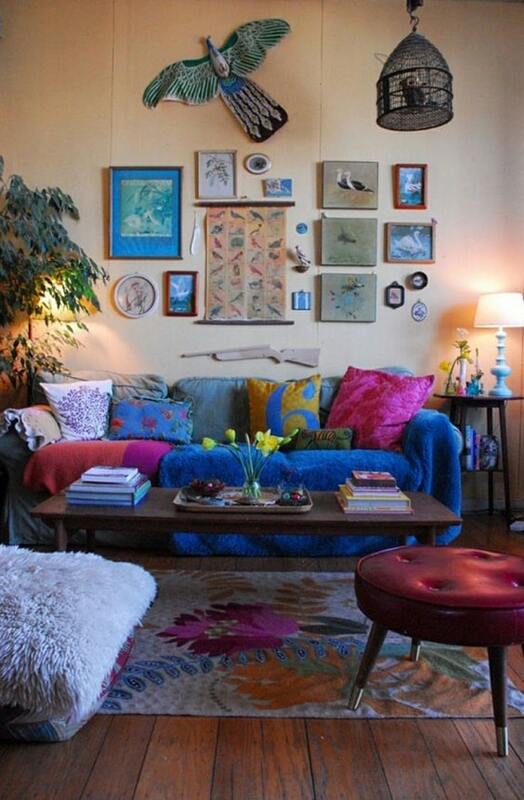 This idea shows how some throw blanket and pillows in bold color cheer up a Boho living room with a soft overall look. Furthermore, a shining red chair and floral rug add a more decorative flair to the room’s decor. 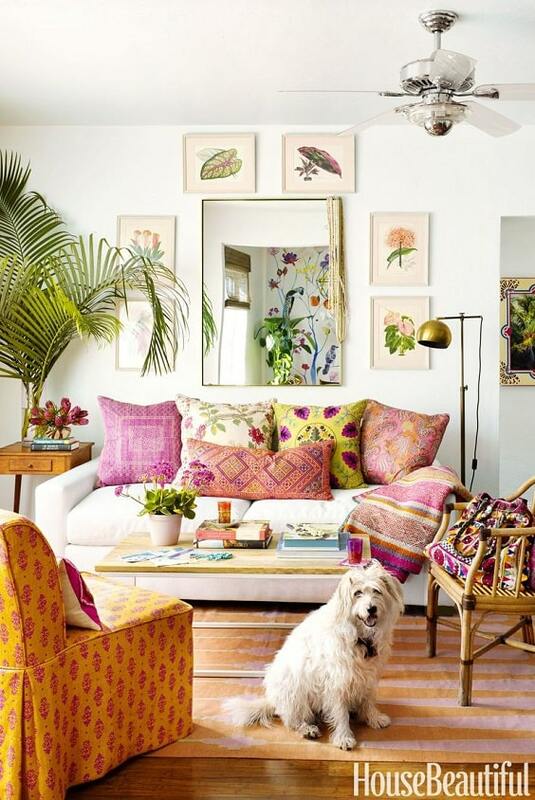 Various designs and colors of the elements of this Boho living room make it a perfect inspiration for you who love the eclectic-style decoration. Teal and pink become the striking shades which add another style to the room which is dominated by organic materials. The white fury rug nicely completes the decor and balance the texture inside the room. 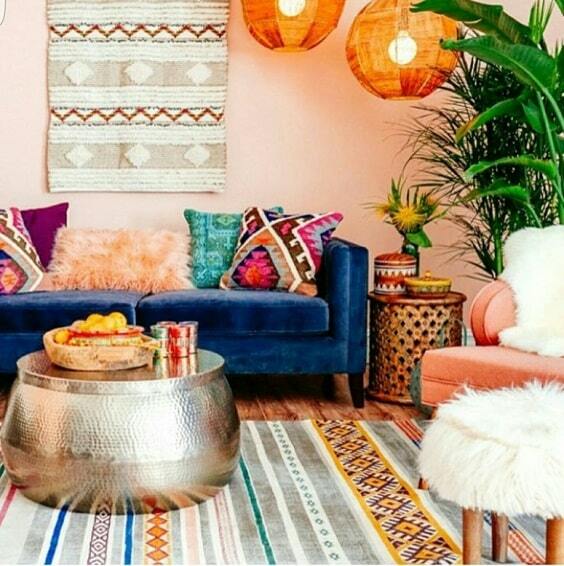 A chich Boho living room which can be a good reference to create a more girly decoration due to its overall color. 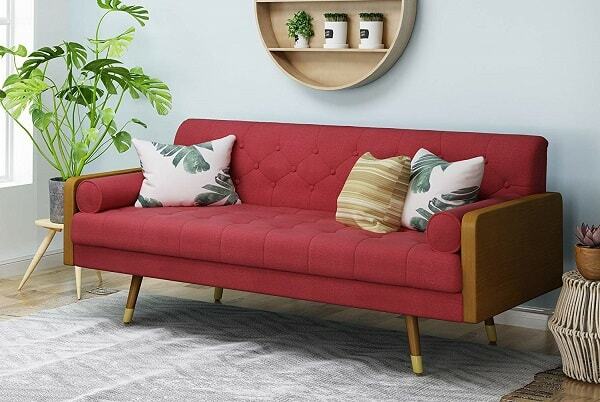 Obviously, a navy velvet sofa adds a bold touch which calmer the pink tone of the room. 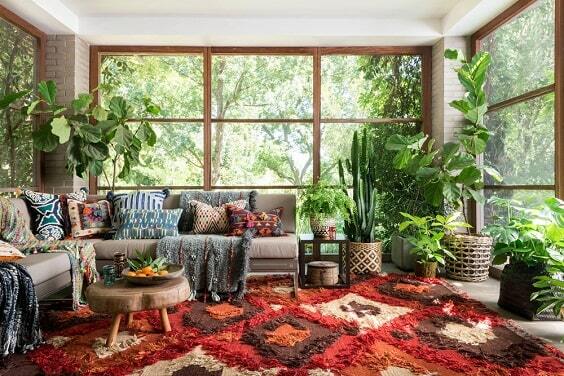 An ethnic rug, earthy accent table, and indoor plant then emphasize the Bohemian vibe around. 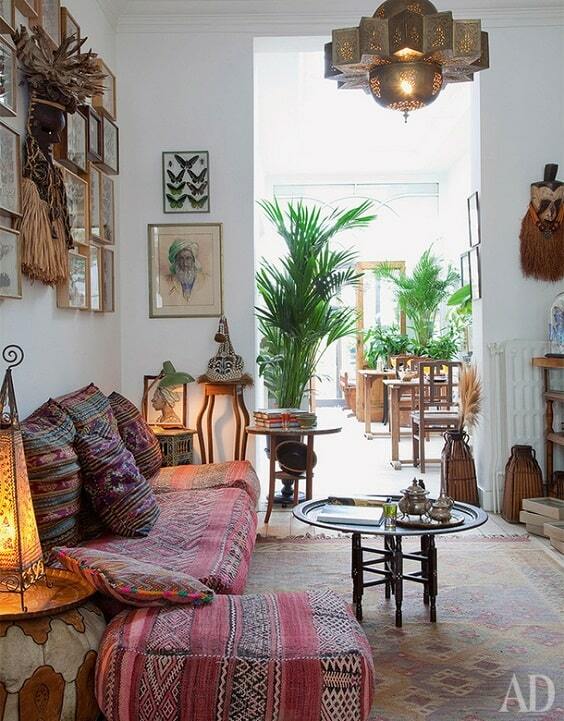 This chic Boho living room is spotted on Zoco Home, an ethnic decor specialist which will definitely inspire you. That is why the room has a very strong ethnic vibe which is applied to the chair’s cover and furniture design beautifully. 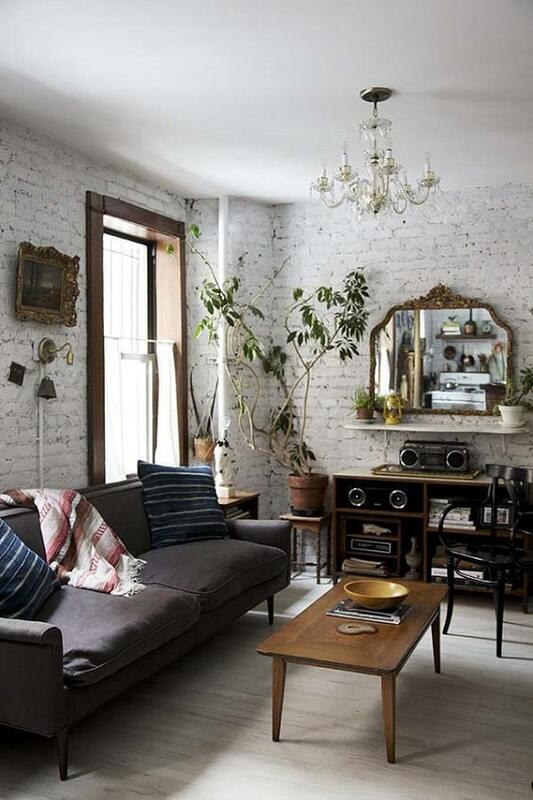 Notice the exposed brick accent which makes its white walls look more decorative in a very unique way. An adorable Boho living room which belongs to Gretchen Jones (via Refinery 29) with an inviting warm nuance which is created by its shades of the brown and white combination. An outstanding artwork and safari rug then adds another style to this decoration. Moreover, the accents of the walls also give such a vintage appeal that enhances the style of room admirably. Here, some pop arts decorate one side of the wall which gives another style to a Boho-inspired decor. 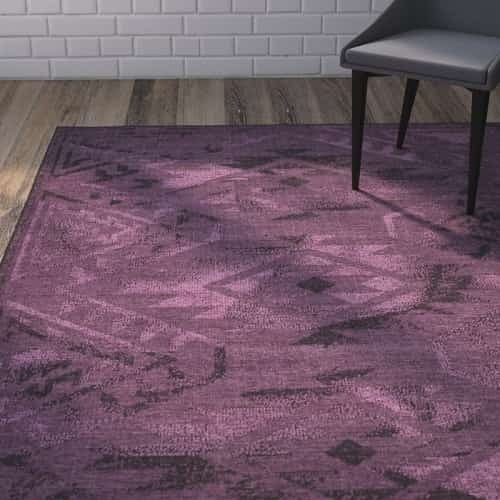 They complement the ethnic decorative purple rug while the brown sofa and log table neutralize the nuance. A yellow tufted ottoman and hot pink decorative armchair are the main elements which vibrantly colorizes this Boho living room with black and white overall look. 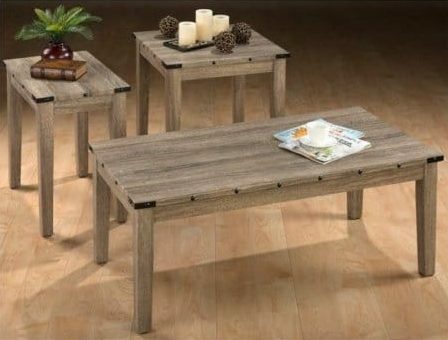 They become the unique additions to those neutral furniture and decor items inside the room. A stunning crystal chandelier and decorative gold mirror give a dramatic touch to a rustic Boho living room which makes it look more glamorous. Other elements in organic and neutral style create a nice harmonious look which complements the room’s white brick walls. 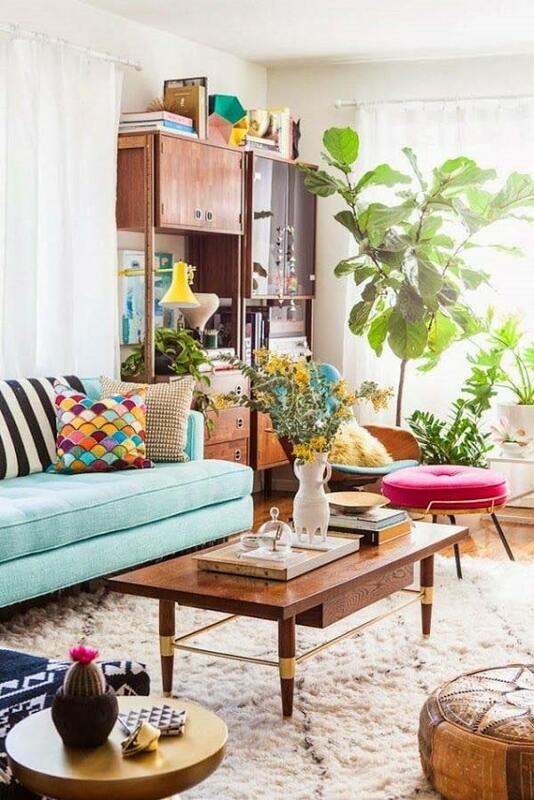 With tons os indoor plants scattered around the room, this Boho living room looks and feels so fresh to enjoy. Even more, its pure white color also makes it more inviting. Then, the suede brown sectional complete with the catchy throws adds a very exhilarating atmosphere. Choose the best Boho living room idea that really suits your needs and taste, and brings the look to your own living room. 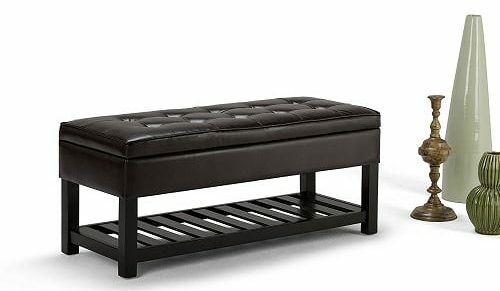 Keep in mind to always creating a nice harmonious look that will give a captivating atmosphere that everyone can enjoy. 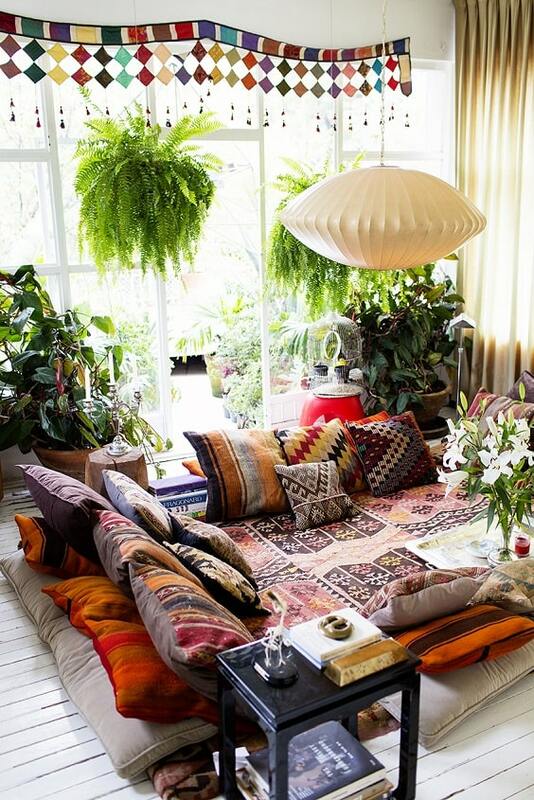 Well, happy creating your own Boho living room now!